Fed-up commuters are losing patience after learning that upgrades to one of the busiest motorways are to continue for at least another three months. Roadworks on the M7 were originally expected to be completed by early 2019. But in January the estimated completion date was changed to April. Following a meeting at Kildare County Council yesterday, local Labour councillor Mark Wall confirmed the project's estimated completion date has now been pushed back to the end of July. "I'm getting a lot of frustration today," he said of the reaction by local constituents and commuters yesterday. "Everyone was looking forward to the end of April. A lot of commuters are very frustrated." The project will see the M7 widened from Naas to the M9, along with the bypass of Sallins and a new interchange at Osberstown, Co Kildare. The road carries almost 61,000 vehicles every day and is the main network connection to Waterford, Cork and Limerick. The council's director of services Niall Morrissey told 'Newstalk Breakfast' yesterday that work crews are making 'great progress' but the job is a daunting one. "It's a difficult job, a tight site of 14km long. 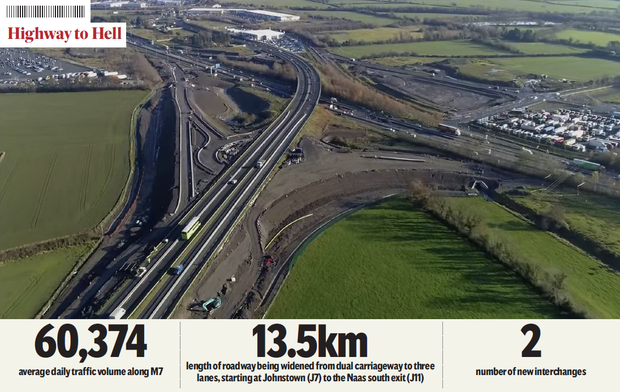 Motorists can see that sections are getting completed, we are making great progress and what you will see is the first phase from Johnstown J8 to Naas south, we're aiming to open that up sometime next month. "People will see a huge improvement in that first section of the journey. As that gets finished, you'll see the crews from that site moving onto the next section and joining up with their other colleagues from Naas south onto the merger," he said. As for the delay, he said: "Back in December we projected we might get it done by April or May, but it's a difficult site, every metre of excavation is a challenge. Two major challenges we faced were demolition of the bridge and construction of the new bridge last weekend, which both went down very well. We're trying not to put out too many dates, but we do see that we're making great progress." Drivers were also advised to slow down to 25kmh last weekend following the demolition of an overpass. The ensuing bottlenecks mean that motorists can expect to add at least half an hour onto their journeys, Mr Wall said. The upgrade project began in January 2018 when Taoiseach Leo Varadkar described it as "a vital motorway for commuters and freight transport, which is prone to congestion at peak times". Conor Faughnan, director of consumer affairs for AA Ireland, said that while it is understandable for commuters and other motorists to be frustrated by the delay, it will be worth the wait in the long run.